There are days when the words “good job” can make all the difference in the world. Sometimes “thank you” can be all it takes to turn a frown into a smile. The words “I love you” are not thought of as three magic words for no reason, and, of course, we all know the one magic word, “please.” Words are some of the most functional and convenient tools at our disposal, and they are often some of the most overlooked. There are many things that go into making a better world. Most of them take time. Many of them take work. Some of them take money. It’s a long, complicated process, and it can be easy to lose sight of the end. We get frustrated because things don’t seem to be moving, or maybe they really aren’t moving at that particular moment. It happens. It’s tempting to give up, sometimes, and then someone comes along and says a few kind words. It can be like flipping a switch. Nothing has changed, except your perspective, but changing your perspective can change everything. Suddenly, for no better reason that because someone said the right thing, you’re ready to go again. You’re ready to try again. Think about a time when this has been true for you. I don’t think I have ever met someone who has not had at least one good experience of this sort, and I suspect they are far more common than just having one. I’m pretty sure there have been times when I’ve had at least one a month. That may be different for someone with depression, someone who tends to stray toward that Give Up line just as a matter of course, but I doubt it’s a severely dramatic difference. More of a difference in degree than a difference in kind. Perhaps you don’t experience it as often, but I’d be willing to bet that you experience it often enough to understand what I’m describing. Now think about how much of a difference those words made for you and, if you can remember the details, think about how hard it was for the other person. It really wasn’t hard, was it? Saying “Thank you,” or, “Good job,” or, “Please,” or whatever the words were that you needed to hear at that moment may have been one of the easiest things that person did that day. Replacing the toner in the office printer was probably more difficult, and almost certainly took more effort. It probably required more thought too. We have an odd tendency to throw out the right words without even paying attention to doing so. 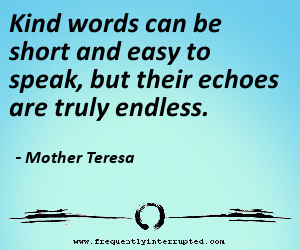 A few kind words cost nothing and can make the biggest difference, yet we neglect to use them over and over. We spend so much time thinking about the big things that we forget the small ones, but the small ones add up. Enough small things grouped together become big things, and the small things are often easier to do. Don’t overlook the easier victories. Make the difference you can, when and where you can make it. Keep in mind, though, that if your actions contradict your words then you’re probably not actually helping anything. Telling someone that they’re appreciated can be the best motivator in the world, but it can’t overcome showing them that they are taken for granted all by itself. You usually have to match words to deeds, or at least not contradict words with deeds. How much this requires will depend largely on how much interaction you have. Working or living with someone daily may require extensive effort, while saying “Have a nice day” to someone you’ll never see again may require nothing more than an appropriate smile. It’s a matter of matching the appropriate need to the situation. Here’s the thing about that: you will have far more fleeting interactions in your life than extended interactions. Even accounting for the amount of work that can be involved in those extended interactions - and it is important work, no mistake - you can still get easy victories, and make big differences with a few kind words more often than not. In fact, for many of your daily interactions, the only significant difference you will have time to make is the difference you can make with a few words, kind or unkind, as you pass in the hall, accept your change, hand over a requested item, or any of the other myriad small interactions we engage in constantly. We don’t get to have deep conversations with most of the people we meet daily, but we can still make deep impacts. If I can make one recommendation today toward living a more mindful life, pay more attention to the things you say. Remember to say things like, “Please” and “Thank you,” “Good job” and “Have a nice day” more often. Remember that words cost nothing, and the smallest words can make the biggest difference. Remember a time when someone’s words made your day, and just imagine how many times a day you can make that kind of change. Now imagine a world where we all took that one small, simple step. It looks pretty good, doesn’t it? Thank you, and I hope you have a fantastic day.